Kangaroo is a common marsupial from the islands of Australia and New Guinea. There are 47 species of “roos.” Kangaroos can hop up to 40 miles per hour (74 kph) and go over 30 feet (9 m) in one hop. When standing, roos often use their muscular tail as a extra leg. These shy animals live about 6 years in the wild and up to 20 in captivity. Most roos are nocturnal (active at night). Many roos are in danger of extinction, but they are also considered pests due to the way they damage crops. An adult male is called a buck, boomer or jack; an adult female is called a doe, flyer, roo, or jill. A baby is called a joey. A group of roos is called a mob. These herbivores (plant-eaters) eat grass, leaves, and roots. They swallow their food without chewing it and later regurgitate a cud and chew it. Roos need little water; they can go for months without drinking, and they dig their own water wells. 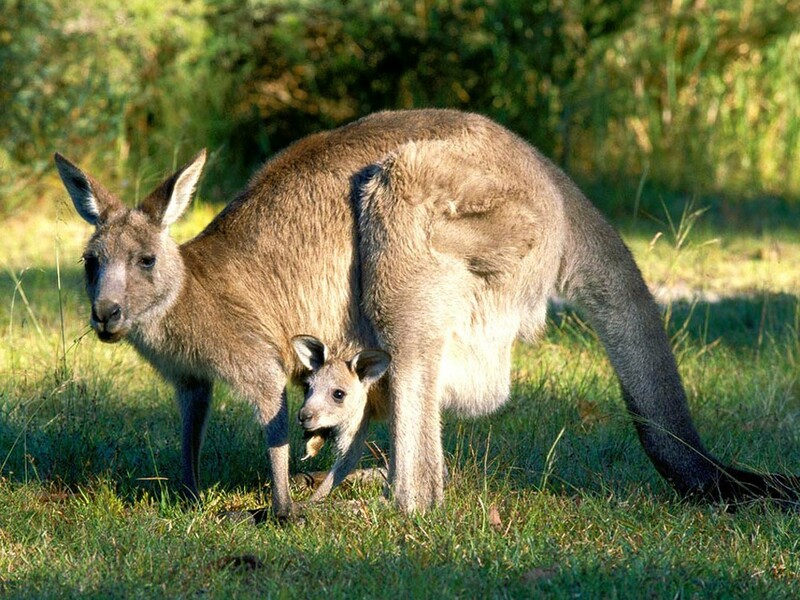 Kangaroo and wallabies range in size from 2 pounds (the Rock Wallaby) up to 6 ft and 300 pounds (the Red Kangaroo). The soft, woolly fur can be blue, grey, red, black, yellow or brown, depending on the species. Females have a pouch in which the young live and drink milk.